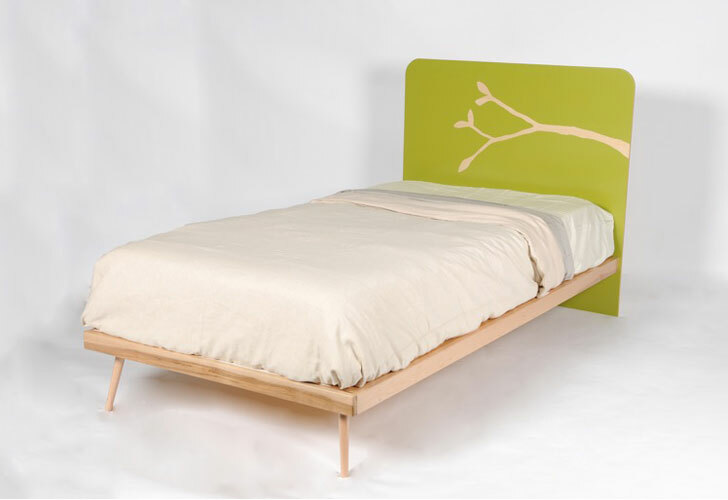 When your little one is ready to transition to a big kid bed, consider the Owyn Platform Bed from Mod Mom Furniture. The simple, wooden twin platform bed comes with a reversible headboard so while your tot may like the colorful side now, you can flip it to the muted, natural birch side later to lengthen the life of the bed. It also coordinates with a dresser and night stand in the collection, along with the Owyn Toy Box, which we introduced you to in the past. Keeping with the branch theme from the Owyn Platform Bed, the Owyn 5-Drawer Dresser features a beautiful walnut veneer branch. The collection is perfect for nature-themed green kid’s rooms. The entire Owyn collection is made in the USA from sustainable Russian Birch plywood that’s finished with low-VOC and Eco-Var finishes. Mod Mom Furniture is now handcrafted by an Amish Furniture manufacturer in Ohio. But that’s all part of the sweet success story behind the brand. Mod Mom Furniture began as an Etsy shop run by a stay at home mom looking for a creative outlet and a way to fill the void of modern style toy boxes. She channeled the skills of her self-taught woodworker father, bought a table saw, and got busy creating. Her modern toy boxes took off and three and a half years later the company partnered with the Amish furniture manufacturer, so it no longer has to be made by just one mom. Not to worry though, L & J Woodworking uses eco-friendly materials and heirloom quality construction techniques, and the wood shop is even powered by steam. 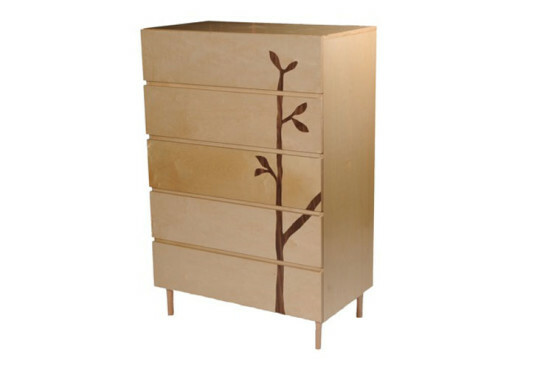 Keeping with the branch theme from the Owyn Platform Bed, the Owyn 5-Drawer Dresser features a beautiful walnut veneer branch. The collection is perfect for nature-themed green kid's rooms. The entire Owyn collection is made in the USA from sustainable Russian Birch plywood that's finished with low-VOC and Eco-Var finishes. Mod Mom Furniture is now handcrafted by an Amish Furniture manufacturer in Ohio. But that's all part of the sweet success story behind the brand. Mod Mom Furniture began as an Etsy shop run by a stay at home mom looking for a creative outlet and a way to fill the void of modern style toy boxes. She channeled the skills of her self-taught woodworker father, bought a table saw, and got busy creating. Her modern toy boxes took off and three and a half years later the company partnered with the Amish furniture manufacturer, so it no longer has to be made by just one mom. Not to worry though, L & J Woodworking uses eco-friendly materials and heirloom quality construction techniques, and the wood shop is even powered by steam.